This article is an account of somewhere I have been back to a few times and in the end pretty much got to the result I wanted so there was a fair amount of pre-planning with this. 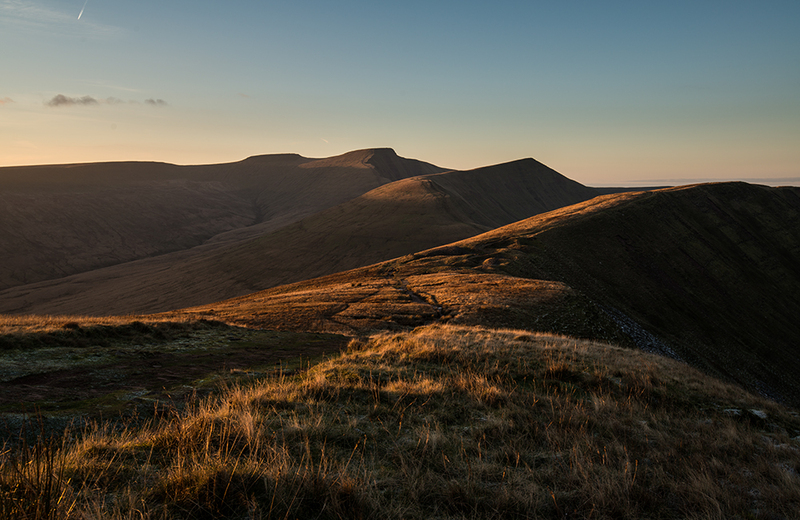 It’s one of my favourite locations on the Brecon Beacons; the view towards Pen y Fan from the eastern side of the mountains. Perhaps if you live in the area or are planning to visit in the near future. For this reason I’ve included a map of the area with brief directions. The easiest way to get here is to drive up the Pontsticill Road from Merthyr Tydfil via Cefn Coed y Cwmmer. The turning is the first on the left on the A465 towards Abergavenny about 400 yards past the A465 / A470 roundabout north of Merthyr. You’ll quickly come to a crossroads; cross straight over and follow the road through Pontsticill for about 7 miles until you get to the end of Pontsticill Reservoir which is on your right. Take the turn left just before the end (signposted Talybont on Usk 8) and follow the road up keeping to the left for about 3 miles. This will take you to the car park marked P on the map. Walk up to the end of the tarmac road (about 400m) and take the track forking to the right; this is known as the Roman Road. 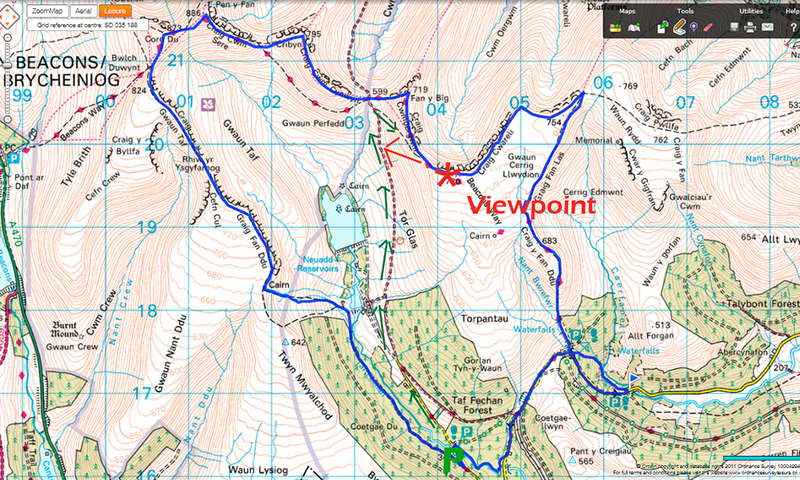 It’s about another 45 mins – 1 hour walk up the track to the viewpoint. The walk to the viewpoint is quite steep involving a climb of around 200m. Take a sharp right uphill as the main track approaches the end Make sure you wear decent walking boots and all-weather clothing; the weather can turn very quickly here. 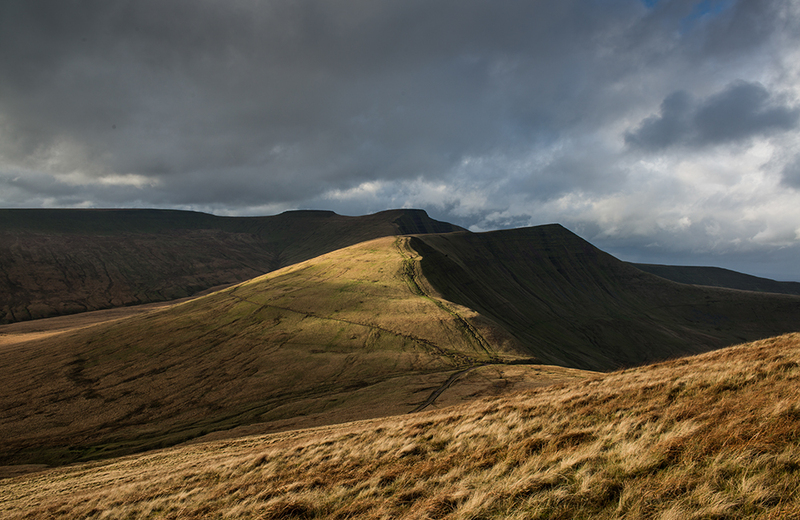 I first saw this viewpoint on a circular walk around the Beacons a while ago (November 2010) and took one pretty much as a record to come back to, but then forgot about it! I only had a light camera and one lens with me as it was more of a walking day than a photographic trip so packed my old Nikon D90 & put it in the bottom of my backpack. I’ve actually sold this a few times since – it’s worth remembering that the majority of the public tend to view pictures more in terms of a memory of where they’ve been than us photographers! During spring / summer the sun would set more behind the mountains, more suitable for the ‘shafts of light’ effect; my favourite type of picture! This was definitely an afternoon / evening shot rather than morning. The light would largely be behind me in the morning producing a flat uninspiring effect. It’s quite effective but I really wanted the light on the background mountains. But by the time I climbed higher to get the effect of the mountains overlapping it had turned to the image below; the sun never came out again. Time to come back another day! Both pictures were shot handheld. On the whole if I can get the aperture and shutter speed combination I need, I prefer to handhold rather than use a tripod as it’s more flexible and quicker, particularly if you have to react more quickly in changing light. My default apertures are in the mid-range between f9 & f13 (if depth of field isn’t an issue), and if handheld I try to use a shutter speed at least of the same value as the focal length I’m using. So the one above, 1/80 sec with a focal length of 35mm is fine handheld. If I can’t do this due to light levels I’ll use a tripod. My next attempt was a couple of weeks later (1st December 2014). Although it was a day with only light cloud I thought there was a good chance of the sun going down without being obscured by cloud and at least I’d get a glowing low light effect on the mountains. Unfortunately the clouds all disappeared leaving clear skies. Also, while the previous day, the sun went down with an extraordinary red glow that really would have lit up the mountains (I was teaching that day so wasn’t able to go up), this time it was more of a muted orange colour, not really the effect I wanted! My next attempt a week later (8th December 2014) was much more successful. 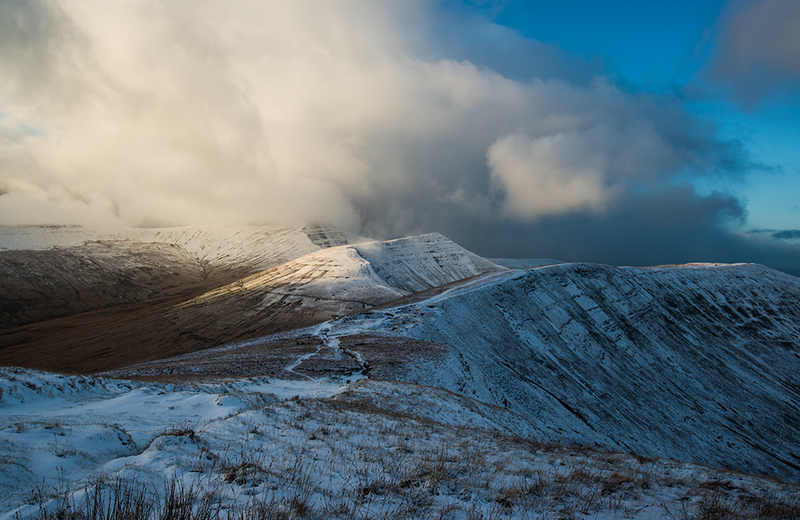 There had been snow in the mountains overnight and a day with heavy showers was forecast. These days are very unpredictable; they can range from a few isolated showers to a series of downpours with little clear spells in between; added to that, mountain weather is much more unpredictable with the peaks themselves creating their own climate. It’s also worth checking the forecast cloud level; sometimes it can drop so far there’s no visibility at all; at other times it stays high enough for the peaks to remain relatively clear. I got to my viewpoint with the weather looking promising; clear spells with heavy showers and with the peaks covered in snow; the kind of afternoon when you really don’t know which way the weather is going to go and the kind of afternoon when ideally you don’t want to hang around with freezing temperatures and high winds. When I got to the viewpoint there was some cloud around but also quite a lot of clear weather so I waited to see what would happen. I’d set myself up at the viewpoint that gave me the clearest view of the mountains and created the overlapping peaks effect that I wanted. I continued to wait and got the one below. About half an hour later the light was a stronger colour of orange but I feel that the image had lost its impact due to the dark clouds lifting and the lack of lighting in the clouds. I’d hoped to get some great light on the peaks as the sun went down but the clouds came over from the south and obscured the sun. The last in the series are from another trip I took up at the beginning of February. I wanted to get one with all 3 peaks lit from the side as the sun went down so chose a day with clear light when I knew that all the peaks were clear of cloud. Conditions had been freezing for a couple of weeks above about 500m – it was also windy so the 90 minutes of so spent on top seemed rather endless! I did wait a while longer to see what would happen as the sun went closer to the horizon. I could take my time with this as it was pretty much unbroken sunshine. The shot above was the optimum version for the effect I was looking for but over the next few minutes the light effect came off the peaks and onto the grass in the foreground. I stayed pretty much until the sun went down; this had unfortunate consequences! As I was walking back down the Roan Road in virtual darkness, I slipped on a sheet of ice that somehow my headtorch managed to miss! It resulted in 2 cracked ribs and some rather severe internal bruising that took about 6 weeks to heal and stopped me using my camera at all without significant pain! I did manage to get myself back down to the car but if I had been unable to move it could have been a worrying situation is there was no phone signal and no-one knew where I was. It pays to take care in the mountains especially in these types of conditions; serves me right for leaving the crampons in the car! So this shows how much work is sometimes needed in producing a strong image. Sometimes we can go to a location and get thing pretty much the way we want them first time; sometimes it needs a little more planning and consideration. Finally it’s worth comparing these to a shot I took from the same ridge a couple of years ago. It’s an image taken in May with much longer daylight, with the result that the sun has moved much further round than in the winter examples. 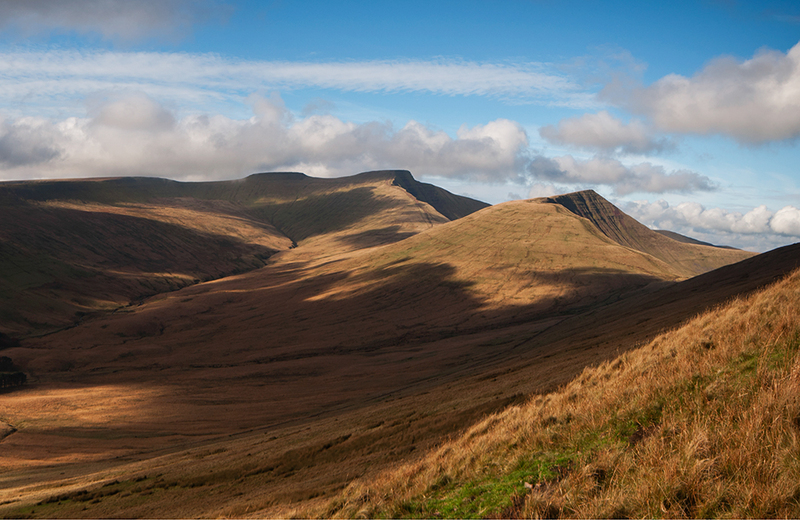 As you can see, rather than lighting up the peaks from the side, the effect is more of backlighting from above. Showery days are perfect for this type of shot, with rapidly changing light. A strong ND Graduated filter is essential to balance sky and land exposure. This was also shot as a panoramic photomerge; it has about 150 degrees angle of view that I needed to capture the light on the reservoir as well as on the mountains. I nearly always take this type of shot handheld and always using manual exposure settings, as the changing light makes the slower operation of the tripod difficult with a wide photomerge. This one was created with 9 original images taken in portrait format. Think about the positions of sunrise / sunset at different times of year, on the effect it has on the pictures and what is suitable for the shot that you want. Keep an eye on the weather forecast and think about how suitable it is for the kind of image you want to create. Don’t forget that unsettled, often very unpromising weather can result in the most dramatic pictures. 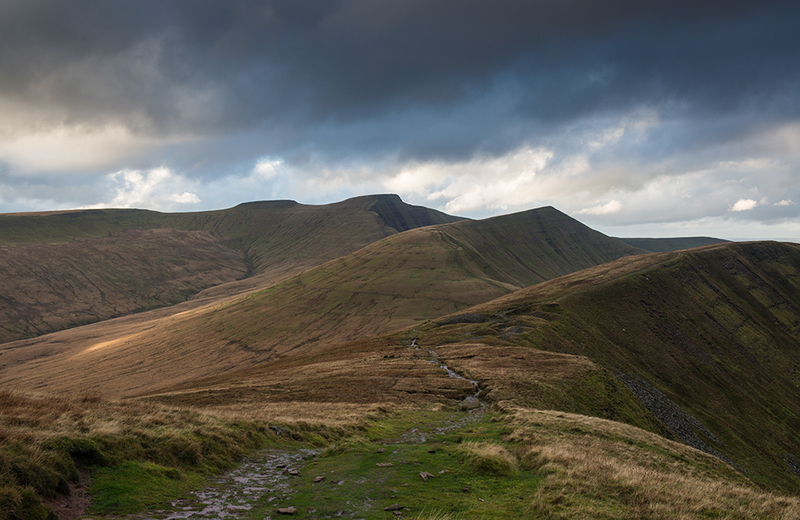 Often days with heavy showers can lead to clear light late in the day and result in great photographs. Note the techniques and settings I used in taking these pictures. If you haven’t already got ND graduated filters, they’re essential for landscape photography against the light. If you’re going into the mountains, go prepared with all the right clothing, footwear, map of the area and emergency supplies and don’t do what I did, tell someone where you are and what time you should be back! All shots in this series were shot in RAW and processed in Adobe Camera RAW and Photoshop CC. All were using manual exposure settings; I find this gives me the greatest control and ability to make fine adjustments according to lighting conditions. Manual exposure is essential for panoramic photomerges as it ensures consistency of exposure across the stitched image.